These numbers reflect the student expenses for the 2018-2019 school year. Amounts will increase slightly from year to year, but as the cost of college increases, financial aid packages will correspondingly increase. Your official financial aid award will be sent to you directly from Tufts. Outside funding up to $2,000 reduces the work study award. Any outside funding in excess of $2,000 will reduce the Tufts Grant by a corresponding amount. Tufts requires all students to have medical insurance. Students can waive the Tufts Medical Insurance if covered by a family member or another medical insurance plan. For financial aid students not covered by another plan, Tufts will cover the cost of the Tufts medical insurance. The travel allowance is variable, based on the distance of the student's home address from Massachusetts. Students are eligible for 8 semesters of aid as long as they maintain good academic standing. Students may choose to replace their work study with a loan. Students use campus and summer job earnings to pay for books and supplies, travel, and personal expenses. Student summer work contribution and work study expectation will increase each year. If a student's income is more than $12,000 in one calendar year, there may be a greater impact on financial aid eligibility. Tufts guarantees to meet 100% of demonstrated need for four years and replaces all loans with grants for families with incomes under $60,000. During the 2017-2018 school year, 40% of first year students received some form of financial aid. Learn more. The average grant for the Class of 2021 is $34,000. 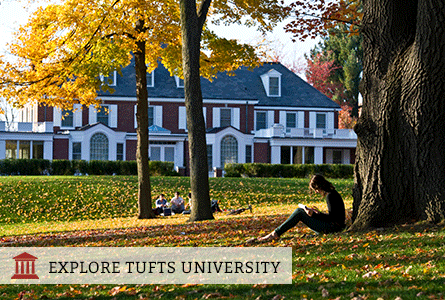 Use Tufts' Net Price Calculator to estimate the financial aid for which you are eligible.